Form OTECH110 or the "Processing Credit Request" is a form issued by the California Department of Technology. The form was last revised in July 1, 2013 and is available for digital filing. 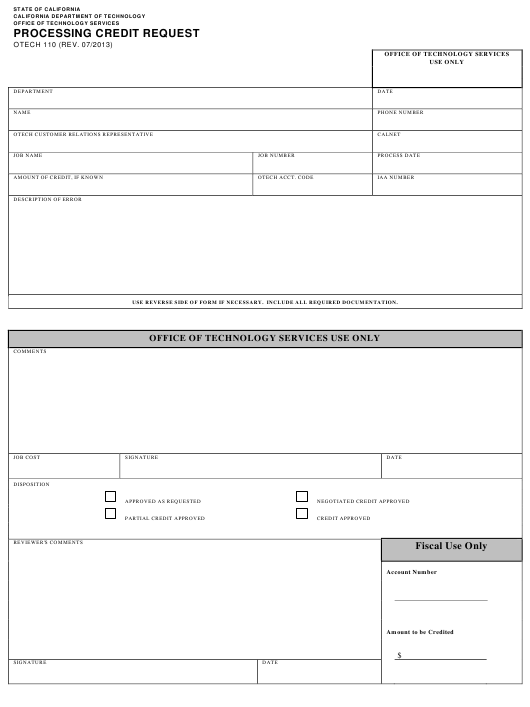 Download an up-to-date Form OTECH110 in PDF-format down below or look it up on the California Department of Technology Forms website. USE REVERSE SIDE OF FORM IF NECESSARY. INCLUDE ALL REQUIRED DOCUMENTATION.